We were introduced to presentations right from the first semester of our BBA degree. We indeed made a few presentations as well however, due to the lack of knowledge and experience most of them weren't that good! While I couldn't make a good presentation during the first semester, I tried to fill that void in the second semester by creating better slides than that of the previous semester. The presentation assignment was as usual a group work, however, I was lucky, as always, to find lazy mates in my group thus getting an opportunity to do the whole work by myself. 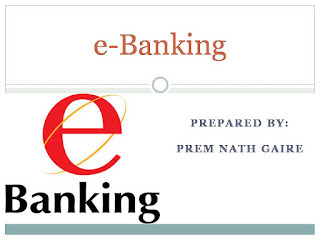 Our topic was "Ebanking". Since it was completely a new topic, I had to brainstorm for a while to get some ideas about which sub-topics to discuss. For that, I wrote down some questions and then grouped them into five categories, thus making it easier to assign a subtopic to each of the five members of the group. I then asked my friends to choose a suitable topic for them and research on their respective subtopic to find content to include in the presentation. Okay, I wasn't much optimistic and asking them was more of a formality and responsibility than anything else. Among the four members only one turned up with some research work. Susmita Ghimire, my colleague and a sincere student at Boston, was the one who did her job herself and I must thank her for being supportive. However, I was fully responsible for the rest of the research work and creation of slides. By then I was more aware about what I should do to make a top-notch (killer) presentation. And that knowledge helped me make one of the best presentation slides for that session. I got praised by teacher for the slides I created. That praise means, to some extent, that I have achieved good skills at creating PowerPoint slides for the standard of BBA second semester. I had researched a lot and accumulated a lot of knowledge about the presentation topic. As a result, I decided not to do any extra preparation for my own stage presentation and speak spontaneously. Accordingly, I gave the presentation and succeeded to some extent to become an spontaneous presenter. My main aim was to remain calm and speak slowly during this particular presentation. Now I am sharing you the same presentation, which I have edited to enhance it further, so that you can view it as your sample presentation. But before that I'm explaining a few things I did to make sure that my slides were better as compared to others. This will help you to get some idea to make your own presentations better. First of all, everyone's major concern is design. However, I just used one of the professional looking designs that already existed in Microsoft PowerPoint and didn't worry much about it. It was pretty good and adequate for the purpose. I then focused on creating a good master slide, the first slide of the presentation, in a unique way. While you might think that putting a welcome message in the first slide is a cool idea, I think it isn't. That’d be better as a second slide. Why? Because when you go on to the stage for presentation and open the PPT file in PowerPoint your welcome message is visible to all even before you start your presentation. So, first your slide welcomes the audience and then you'll repeat the same after a few seconds. So, while my friends put welcome messages, I included the image and text directly tackling the topic of my presentation. With the topic revealed in advance and the first attractive slide shown to the audience it will create a kind of curiosity in them to learn more about the topic. As a result, they will pay more attention to you during your presentation. I think this is a good practice, especially for college presentations. Furthermore, I used images uniquely and in a well balanced manner along with the text. A very good practice in presentations is to include as little information as possible per slide, such as a small piece of text based information and a single image. This practice isn't much viable in college presentations, partly because you need to prepare slides in a rush to meet the deadlines and partly because you need to consider being able to remember the content while giving your presentations. (The more information you put in slides the less you have to remember.) Another reason this practice would be difficult is because it increases the number of slides dramatically and thus the volume of work especially if you are considering to include some kind of animations or picture in each slide. However, even though it is difficult, it is a good practice and you should try to follow it. For that, you should make the text concise and compact. So, reduce sentences to short phrases; use graph to present statistical or numerical data; and use a single good and relevant image for each slide. All this will help you to make your presentation much better. While trying to adhere to this practice I made more slides than my friends had expected. As a result, my group members looked at me with a kind of resentment when I said that everyone will have 3 slides each. A presentation with just over 15 slides wasn’t too much for the bachelor level students!! So, that’s all about my BBA second semester presentation on E-banking. Here’s the link to it if you would like to download to view it. I hope that this will be a good sample presentation for you.